John Wells’s phonetic blog: a prophetic patronymic? 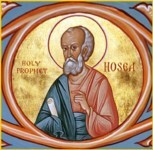 The minor prophet Hosea is known in BrE as həʊˈzɪə, rhyming with nonrhotic oh dear əʊ ˈdɪə. So is the eponymous book of the Old Testament and the corresponding (rare) forename. In LPD I gave the AmE version as hoʊˈziːə, following K&K though ignoring the variant ˈhoʊzɪə that they also mention. I now see that Wikipedia claims that it is pronounced hoʊˈzeɪə, and indeed the 11th edition of Merriam-Webster’s Collegiate gives both -ˈzeɪ- and -ˈziː-, in that order. I have never heard the -ˈzeɪ- form in BrE, and assume that in AmE it is a recent spelling pronunciation, perhaps influenced by Spanish names and involving contamination from José. Or so I assumed when I first encountered this surname. The BBC Pron Dict of British Names, however, gives no fewer than three possible pronunciations, none of which is the həʊˈzɪəsən that the putative etymology would imply. They are həʊˈsiːzən, ˌhəʊsiˈeɪsən, and ˌhəʊsiˈæsən. The Oxford Names Companion confirms the etymology, locating it as originating from Shetland: a patronymic from Hosea, which was “probably originally Osie, a dim. of Oswald”, but “later altered by association with the name of the biblical prophet”. Be that as it may, the name has now acquired a much higher profile in BrE because of the holiday company Hoseasons, which operates throughout the UK and advertises widely on television. The ads call it həʊˈsiːzənz, as if the name was a compound of season, and so I think do its employees and its customers. I'm sure there are quite a few Joel(s)sons around in Britain, some Amossons, a couple of Na(c)humsons maybe, and indeed hardly any Zephaniahsons, if at all. Most of the Joelsons/Joelssons/Johlsons will be Jewish immigrants or their descendants. The London telephone directory lists a few Amassons and one Joelsson. Regarding Hoseasons, I think I've mostly heard it pronounced ˈhəʊsiːzənz. And it has never occurred to me until now that it might be connected with Hosea. As for the latter, I think I have a non-RP trisyllabic pronunciation, though I've never been a church-goer, so it's not a name I've heard very often. My Oxford self-pronouncing Bible and my Oxford Bible Reader's Dictionary both give it three syllables (hō-ṡē′-ă), but then they don't actually have any way of representing an ɪə diphthong for a word not spelt with an <r>. /hoʊˈzeɪə/ is the only pronunciation I'm familiar with. The villainous captain in Robert Louis Stevenson's Kidnapped is named Elias Hoseason, which when I first saw it (and since) I immediately read as /hoʊˈzeɪəsʌn/; I do not recall seeing that surname again until this very posting. In "Isaiah", we have BrE /aɪˈzaɪə/ and AmE /aɪˈzeɪə/ (at least: those are the only pronuncations I've heard in each country). I'm completely out of my element considering the knowledge of most contributors to this blog, but wouldn't Al Jolson's name likely correspond with the patronymic for Joel? That was my first thought and on checking that I indeed spelt his name correctly I see that he was born Yoelson. That Y is how a name that we spell with a J would have been pronounced in Judea and it has that bonus E too. How would the Irish pronounce "Hosea"? I'm aware that there is an Irish pronunciation for "Jesus" using the FACE vowel in the first syllable. I'm wondering if FACE might be used in the second syllable of "Hosea". I grew up saying hoʊˈzeɪə in Atlanta, Georgia, USA in the 1940's, so it depends on what you mean by "recent". You can find a lot of Bible names pronounced here: Bible Words Phonetic Pronunciation. A self-pronouncing Bible is also available online here. I'm sure I learned my pronunciation of [hoʊˈzeɪə] from my father a now-retired Lutheran pastor in his early 80s who grew up in Jersey City, NJ but studied at the Missouri Synod seminary in Springfield, IL. Since our liturgical tradition is historically German-based, I wonder if the German pronunciations of Biblical names had any bearing on this? I've been in church in Malaysia, Singapore, the UK and Australia, and I've only ever heard /həʊˈziːə/. However, although I say /dʒʊˈdiːə/ for Judea, it is not uncommon for people to say /dʒʊˈdeɪə/. The German influence mentioned by Paul is plausible. But there's also the tendency to give more 'foreign' values to vowels which I think is what is happening to Judea, and also Hosea in American English. A Google search reveals there are some people with the surname Amoson (one s). I also wonder if the surname Mosson is derived from Amos. Of course, the most common patronymic from Amos is simply Amos, the surname of one of my great grandmothers. I grew up a few miles from Hoseasons in the 50s/60s and have only ever heard the 'seasonal' pronunciation. Growing up and attending church in Glasgow, I and everyone I know pronounced this name [hoʊˈzeɪə]. It's the only pronunciation I was aware of before reading this post. There was a Polish (Jewish) philosopher, Janina Hosiasson-Lindenbaum, of some achievement, Germans executed her in Wilno in 1942. See true profile --- full name. There is a Danish footballer by the name of Absalonsen, but he might be Jewish.